Jessie Lamb Lattimer about 1918. 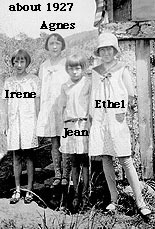 Irene, Agnes, Jean and Ethel about 1927. 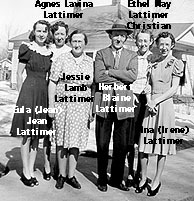 Jean, Agnes, Jesse and Herb, Ethel and Irene about 1936. 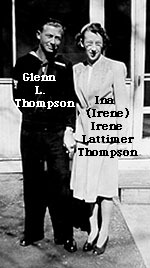 Agnes and Larry Dilka about 1941. Allen L. Lattimer (wearing overalls) "looking for gold" in Gunnison, Colorado sometime after 1914. Herb and Jessie Lattimer with Shirley and Bud Christian about 1942. 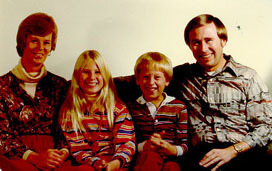 Sharon (Henry), Sheri, Scott, and Jerry Thompson.